This Insights Discovery profile is based on Angela Baxley’s responses to the Insights Preference Evaluator which was completed on 5/16/2007. The origins of personality theory can be traced back to the fifth century BC, when Hippocrates identified four distinct energies exhibited by different people. 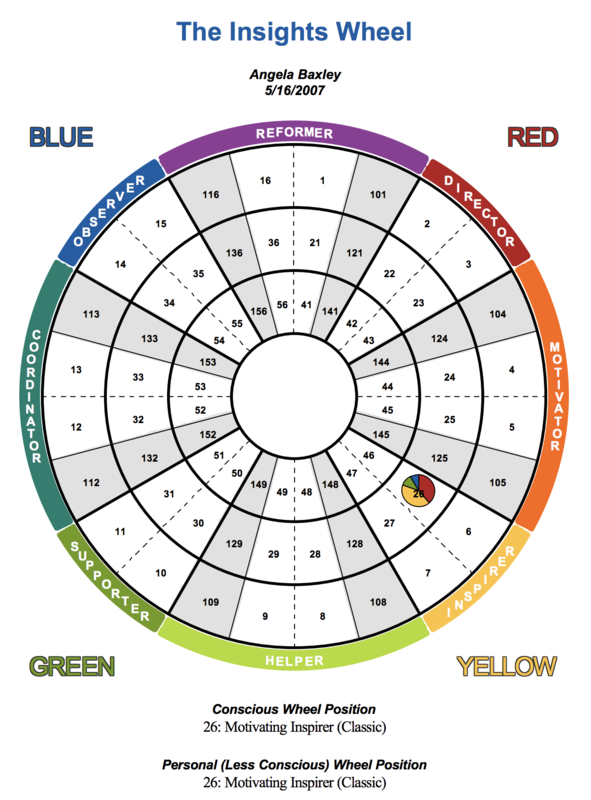 The Insights System is built around the model of personality first identified by the Swiss psychologist Carl Gustav Jung. This model was published in his 1921 work “Psychological Types” and developed in subsequent writings. Jung’s work on personality and preferences has since been adopted as the seminal work in understanding personality and has been the subject of study for thousands of researchers to the present day. Using Jung’s typology, this Insights Discovery profile offers a framework for self-understanding and development. Research suggests that a good understanding of self, both strengths and weaknesses, enables individuals to develop effective strategies for interaction and can help them to better respond to the demands of their environment. Generated from several hundred thousand permutations of statements, this profile is unique. It reports statements which your Evaluator responses indicate may apply to you. Modify or delete any statement which does not apply, but only after checking with colleagues or friends to identify whether the statement may be a “blind spot” for you. Use this profile pro-actively. That is, identify the key areas in which you can develop and take action. Share the important aspects with friends and colleagues. Ask for feedback from them on areas which seem particularly relevant for you and develop an action plan for growth personally and interpersonally. These statements provide a broad understanding of Angela’s work style. Use this section to gain a better understanding of her approaches to her activities, relationships and decisions. Angela displays fierce loyalty to and for people who report to her. She is accomplished at working with individuals and groups and can quickly find herself pushed into a leadership role. She may have had personal experience of the view that worthwhile success comes only after suffering significant misfortune. Angela seeks greater fulfilment in her life through the offering of help and service to others. At times, events can overwhelm her and she may find it almost impossible to say “No”, even when the demands are unreasonable. Her focus is on the immediate, resulting in a rather low tolerance for detailed procedures and routines. Angela is sympathetic, empathic and affable. She is motivated by approval and reacts unfavourably to indifference or rejection from others. She is strong on initiative and creativity, but may often be weak on the completion of projects. Angela is stimulated by challenges and often shows ingenuity in meeting them. She is warm and gracious and believes in a philosophy of “live and let live”. With her friendly organisational skills, Angela is supportive of other colleagues and will enthuse over most projects. Angela wants to sample the best that life can offer. She has a sense of adventure and likes to keep her spirits and expectations high. At her best in jobs which deal with people and situations that require co-operative working, she dislikes impersonal tasks and work demanding factual accuracy, unless she can be free to include the people factor. She should take care to include the practical details in her projects and continually try to look at situations from an objective viewpoint rather than just her own perception. Angela is energetic, enthusiastic, responsible, conscientious and persuasive. She will take every possible opportunity to generate new relationships or to be with others. Learning how to use accepted methods of organisation and time management will help her to overcome a tendency to want to procrastinate. When an inspiration materialises, she will throw herself into it completely. Attending to others’ wants is felt by her to be a satisfying, legitimate way of expressing her own deeper needs. She is used to doing several things at once, but others may view some of this as superficial activity. Seen by others as spontaneous and charming, Angela is persuasive, loves surprises and enjoys finding unique ways of bringing delight and unexpected pleasure to others. Her life will tend to be a series of initiated, but unfinished projects. She gravitates to other people and is highly skilled at understanding others’ needs and motivations, usually appearing friendly, tactful and sympathetic. Socially adept, even-tempered and tireless in her efforts to bring about peace and well-being, she tends to hold the perfect relationship as the ideal. The gift of sheer adaptability means that Angela has an uncanny skill for making life into an enjoyable performance, juggling many activities and people and usually enjoying the limelight. She is rather indifferent to authority, preferring a flattened structure where everyone is equally capable of advancing. Angela is both charming and popular, constantly enthusing through her gift of ready articulation. Angela’s feelings play a prominent role in her life and she manages to inject a friendly element into any work she is assigned to or involved in. As she is highly articulate with a quick sense of humour she is often the life and soul of the party. Shifting attention inward for long periods may produce anxiety for her as she prefers to look outward towards others for her emotional security. She likes to seek out the company of others and is a good conversationalist. Placing a high value on her harmonious relationships, it is not surprising that people turn to Angela for encouragement, nurture and support. Usually verbal and persuasive, she will seek or wish to withdraw quickly from confrontation unless provoked to the extreme, when she may go “off the deep end” verbally. She functions best when she is talking with people, which she enjoys immensely. Much of her pleasure and satisfaction comes from other’s warm responses. She encourages freedom and independence and is good at getting things done through other people when she slows down and takes the time to delegate. Angela has a remarkable ability to get people to follow her lead. She attracts many friends and acquaintances. Angela is very co-operative and articulate, communicating sympathy, concern and a willingness to become involved. Usually exciting for most of those involved, her activities do tend to leave some others exhausted by the process. Preferring a harmonious outcome, Angela will go to great lengths to ensure the preservation of relationships. She may often make decisions based upon how she feels about a situation, rather than how the situation actually is. She has the ability to appear to listen to other people’s viewpoints but may not necessarily be hearing or intending to action them. She is likely to decide in favour of the solution that brings the highest level of approval from others. In decision-making she may prefer to apologise for exceeding her authority rather than getting permission in the first place. She views talking through ideas with people to promote decision making as an effective strategy of itself. Others may see her decisions as unrealistic in certain circumstances. She is prone to jump to conclusions and may act on assumptions that may well turn out to be wrong. She recognises judgements that rely heavily on logical analysis, but then may ignore this in making her decisions. A tendency to take rejection and conflict personally may lead to her not taking early notice of the opinions of key members of the team. She is prepared to make decisions through group consensus. She may choose to change her decisions if it turns out that someone may be adversely affected by them. She tends to make choices around her own personal feelings which may be as important to her as more objective data. She may unconsciously manipulate the process to get her own way. Angela will usually encourage democratic or even consensus decisions, as opposed to having them imposed autocratically. This section identifies the key strengths which Angela brings to the organization. Angela has abilities, skills and attributes in other areas, but the statements below are likely to be some of the fundamental gifts she has to offer. Sees the positive in every situation. Adaptive and versatile people skills. Democratic – will involve others. Can be bubbly, effusive and spontaneous. Jung said “wisdom accepts that all things have two sides”. It has also been said that a weakness is simply an overused strength. Angela’s responses to the Evaluator have suggested these areas as possible weaknesses. May become depressed if bored or forced to moderate tedious tasks. Not always attracted to what is practical. Her need for variety may leave some tasks incomplete. May be prone to embellishing the truth. May miss others’ reactions to her actions. Becomes impatient with routine and repetition. May open her mouth and fall in. Dislikes and avoids routine tasks. Finds it difficult to say “no” if relationships are being threatened. Each person brings a unique set of gifts, attributes and expectations to the environment in which they operate. Add to this list any other experiences, skills or other attributes which Angela brings, and make the most important items on the list available to other team members. Is the life and soul of the group – often “centre stage”. Is a forthright advocate for the team. Motivates others with contagious enthusiasm. Provides inspiration and image for the rest of the team. Is seen as a good team builder. Has strong personal and interpersonal skills. Can provide high activity and variety. Maintains and generates high team aspirations. Communication can only be effective if it is received and understood by the recipient. For each person certain communication strategies are more effective than others. This section identifies some of the key strategies which will lead to effective communication with Angela. Identify the most important statements and make them available to colleagues. Talk tangibly and with enthusiasm. Use an easy-going and fun approach. Keep up a lively, but steady pace. Recognise both her and her achievements. Encourage her to stick to the agenda. Use warm gestures and expressive body language. Don’t always expect brief, specific answers. Be clear on completion details. Be personable and give sufficient time to “peripheral” matters. Talk about her and areas she finds stimulating. Be alert and quick on your feet. Certain strategies will be less effective when communicating with Angela. Some of the things to be avoided are listed below. This information can be used to develop powerful, effective and mutually acceptable communication strategies. Attempt to impose too much structure and formality. Get carried away by her enthusiasm. Take issue with her demeanour or jaunty disposition. Fail to recognise her best personal achievements. Talk slowly, mumble or whisper. Assume that her sunny disposition means that she agrees with everything you say. Criticise, condemn or suppress her enthusiasm. Involve her in formal, lengthy or tedious meetings. Act aggressively or reject her ideas without explanation. Take credit for her ideas. Impose final judgements on her views and opinions. Make your lack of interest in her “problems” too obvious. Seen by many as a smooth talking persuader, Angela may seem indifferent to people who appear to be less of an extraverted achiever than herself. She can sometimes make mistakes by making decisions before receiving all the information. Because of her strong desire for harmony, she can overlook her own needs and ignore real personal problems. Taking the time to pay closer attention to what is actually going on in the world around her and listening carefully to both the input and reactions of others will help her. She is genuinely interested in others and may seek to get on closer terms with those who particularly interest her. She is occasionally taken advantage of and can be hurt in the process. It is difficult to know what to expect from her next. She would much rather engage in quick intellectual banter than complete some mundane task or consider spending quiet time on her own. She tends to ignore her problems instead of finding rational solutions for them and needs to try to keep her eyes and mind open as well as her heart. Her constant ready socialising can interfere with the job at hand and get her into trouble. Because she is rather easily distracted, she may have difficulty disciplining herself to complete the task at all costs. Often after she has enjoyed an initial experience, if necessary backup to attain the anticipated outcome is not forthcoming, she blocks the experience from her mind and moves on. She needs to learn to deal more directly and honestly with conflict, trusting that her natural sensitivity to others’ feelings will provide her with what needs to be done even in the most difficult situations. Her natural quickness and pressure to anticipate what is coming means she occasionally assumes wrongly that she knows what a person is going to say, and is tempted to jump in to finish their sentences. Sometimes she is so intent on her own plans that she doesn’t stop to listen to what others have to say. She could sometimes slow down and pay closer attention to the finer details of her projects. Really listening to the views of others. Concentrating on the task in hand. Regularly reflecting on the days events. Reaching decisions only after weighing up all the alternatives. Gathering more information than she feels may be necessary at times. Constant reminding of the need to consider alternatives and anticipate consequences. Being less vocal at group meetings. Slowing down and thinking things through. Becoming neater, tidier, more systematic and orderly. one and to identify any possible frustrations. She can use her social skills to the full. She does not have to sit quietly in reflection for longish periods. There is ample opportunity for social contact with colleagues. She has freedom from authority and bureaucracy. There may be noise, i.e. music or a general “buzz” of excitement. There are few rigid rules of time-keeping or dress code. Her natural creativity is given room to flourish. “Brainstorming” sessions are a regular event. She can question the rules and the traditional ways of doing things. There is ample opportunity to express ideas. This section identifies some of the most important strategies in managing Angela. Some of these needs can be met by Angela herself and some may be met by her colleagues or management. Go through this list to identify the most important current needs, and use it to build a personal management plan. To understand the need for time-management disciplines. Organised elements of work which include attention to the details. Occasional performance reviews and a sharp shock to maintain her focus. To know clearly where the future prospects and opportunities lie. Support in completing tasks she starts. Support to complete the task more thoroughly. Involvement in all the team activities. More frequent evaluation and appraisal. Consistent recognition of her achievements. To maintain focus and direction. It has often been said that it is not possible to motivate anyone – only to provide the environment in which they will motivate themselves. Here are some suggestions which can help to provide motivation for Angela. With her agreement, build the most important ones into her Performance Management System and Key Result Areas for maximum motivation. Personal appreciation and public recognition for a job well done. “Pioneering” opportunities with little limitation. Being made to feel “one of us”. Authority to match her responsibilities. Seeing the results of her efforts. Rewards that reflect her immediate needs. Tasks which necessitate “group” involvement. Knowing she has the approval of others. Tasks which predominantly involve the group. There are many different approaches to management, most of which have different situational applications. This section identifies Angela’s natural management approach and offers clues to her management style, highlighting both gifts and possible hindrances that can be further explored. Inspire the team with her grand visions. Give team members plenty of freedom. Lose sight of the objectives of meetings, spending too much time discussing personal issues. Allow her team a great deal of freedom. Encourage staff development at all levels. Welcome free expression within the team. Be passionate about her ideas. Be seen as manipulating the process when she sells the solution to the team. Create an air of bustle to help with the meeting of deadlines. Inspire others with her forward-looking orientation.